HI! on day 4 of my 52Quilters take over. I learned quilting thinking there were rules that had to be followed when creating a quilt. I learned how to construct the traditional blocks like rail fence, log cabin, flying geese, etc. There are beautiful quilts made using traditional blocks and techniques. Although I followed the rules I learned, I did not really feel a connection to my creations that is until I discovered Modern Quilting. I remember attending a lecture by Jacquie Gering. Talk about freeing. I was always a little quirky and I enjoy my individuality. I like being a little different. I was already hooked on quilting but after getting into Modern Quilting I found a renewed passion for it. 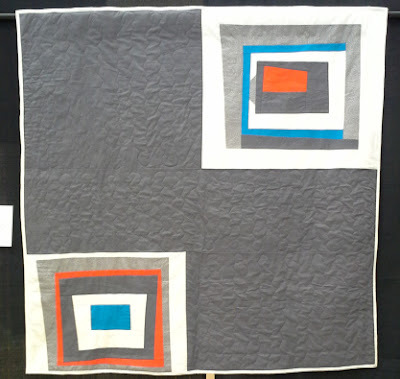 I joined the Detroit Area Modern Quilt Guild and began to follow the national Modern Quilt Guild. I now feel a connection to my creations and feel that I am able to really express myself creatively through the quilts I create.